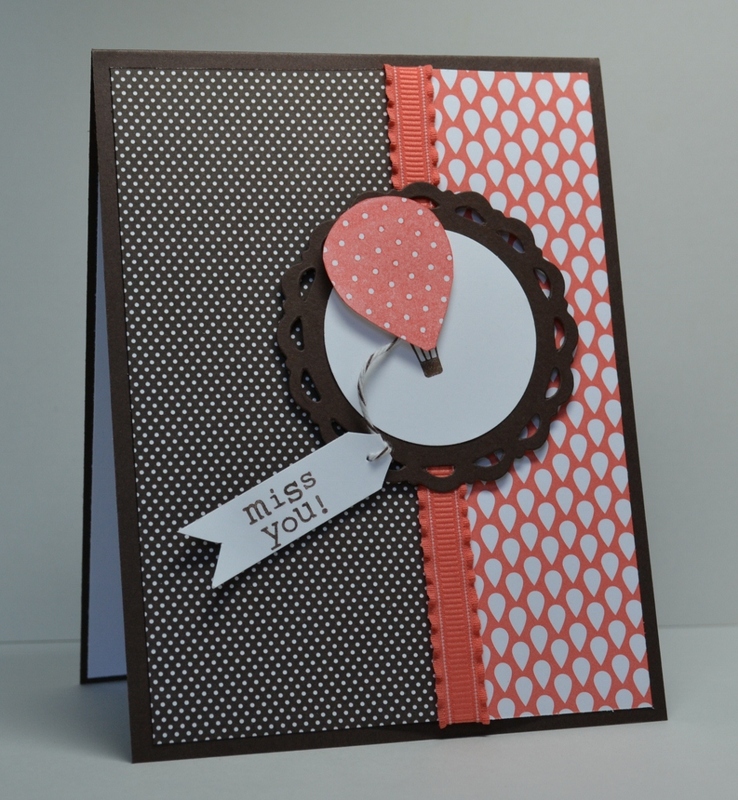 Welcome to the Stampin’ Addicts New Catalog Mega Hop!!! We are celebrating the new Stampin’ Up 2011-12 Catalog Stampin’ Addicts style! If you just hopped over from Heidi’s blog, RunningwScissorsStamper, I know you have been blown away by her projects with Under the Big Top. That three ring circus card…fantastic!! She never ceases to amaze me with her creativity! I will continue the Big Top Product Suite trend with Up, Up and Away. Words cannot describe how thrilled I am with this set!! When I first saw this set, I had a vision of vintage balloons! Then I saw the unbelievable beautiful Well Worn DSP and I knew that they had to be combined. I stamped the striped balloon image on the River Rock print and cut it out. The other balloon comes from stamping on the reverse side of the paper with the solid balloon image and then cutting it out. I used my Color Spritzer Tool to add a little splatter of River Rock ink on the image panel and the new Soft Suede Taffeta is put together with Linen Thread and an Antique Brad. This is a card for a college graduation and I love it! 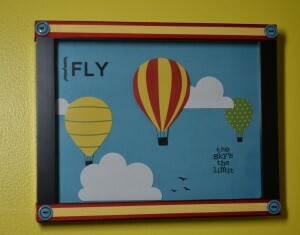 I love the colors on in the Big Top Product Suite (p. 62) and wanted to make a fun and quick project with them. 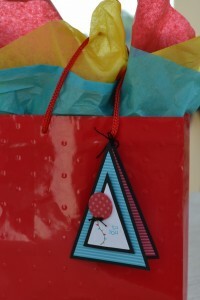 This is a little triangle gift tag made with my new Perfect Pennants Die for the Big Shot. I used my 1″ circle punch to create a party balloon and “to you” is inked with a Stampin’ Write Marker. The inside uses the remainder of the sentiment (“happy birthday”). This is an easy tag to make and I will provide the instructions next week. 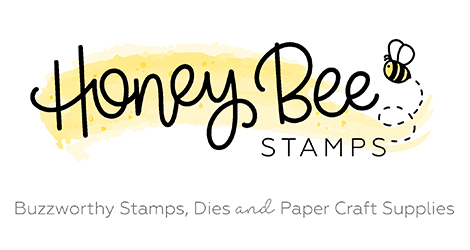 If you have ever worked with Stampin’ Up’s Designer Series Papers, you already know that they are amazing. I really liked the Berry Blossoms Product Suite in the catalog (p.99) but when I opened the paper in person…WOW!! This Calypso Coral pattern practically asked to be used with Up, Up and Away and the Early Espresso pattern mimics the polka dots in the balloon. I used one of the scalloped circles from the Perfect Pennant Die as my frame and the lovely Ruffled Ribbon to add more texture. This classic layout gets a little wow factor from the banner attached with the Early Espresso Baker’s Twine. My final project is probably the one that makes me the happiest!! 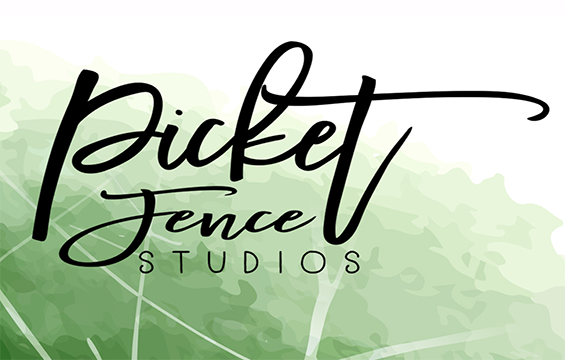 This is a My Digital Studio creation made just for my youngest son’s room. As you can see, his walls are Daffodil Delight so what better than the Big Top Birthday Embellishments Download as a place to start? I used the digital Up, Up and Away to create the balloons. The hardest part of this project was taking a picture that shows how cute it is! I will be back with more specifics on this next week, too! Clearly, flying is near and dear to my heart and this set has really inspired me! I hope that you feel just as inspired to make fabulous projects with it! Now off to your next stop on the hop. Cindy over at Heart’s Delight Cards has some super projects made with Pennant Parade. 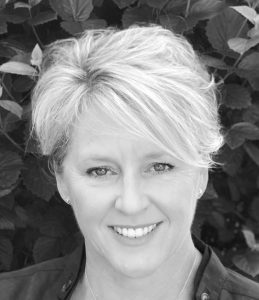 Just wait until you see her golf card, and her Christmas card, and…. Make sure you come back next week for more specifics on my projects. If you have any questions you really want answered, let me know in a comment. Enjoy the hop! Great stuff, Jen! I see you already have a start on the upcoming Steampunk challenge too! Jennifer you have such great style. All of the projects are lovely! Great seeing the balloons used in a vintage style, too; and so clever to use them for graduation – perfect! I never thought of vintage with those balloons, but wowzer, it works great! I love it all. The MDS frame, though, is pretty sweet. Clever, clever Jen! You really added a creative spin to this stamp set. Gotta say that vintage card blew me away! Wonderful variety Jen! 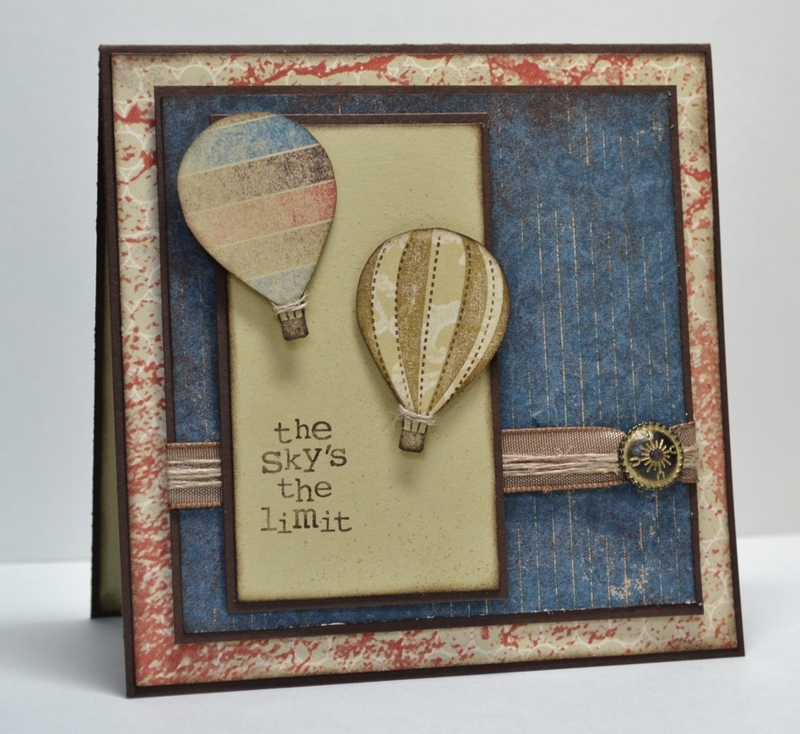 I love the vintage contrasted with the others, and your MDS creation is fantastic too! Love your projects!! I already kinda wanted this set, now I’m nearly certain I do! Your graduation card gave me more ideas for this set. 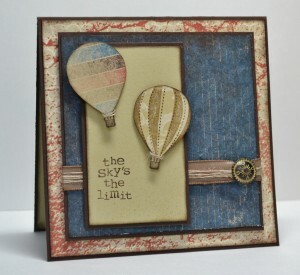 Love the balloons stamped on dsp and the little one you made for the pennant tag! Jennifer, you totally rocked this set! I love the faded, vintage feel of the first card, and the way the Calypso Coral DSP mimics the shape of the balloon on the second card. The framed piece for your son’s bedroom wall is so sweet….what a wonderful way to encourage him to reach for the stars! Jennifer, your projects are just fabulous! I especially love your DSP balloons, and that Pennant Punch tag. . . . I love everything you did but especially using that Well Worn DSP. That has got to be my favorite. Thanks for the inspiration. These are all fantastic! I love the gift tag, and the MDS artwork is just amazing!! I did not have this set on my radar until I saw your vintage take on it. Mm..mm.. right on to my shopping list it goes! Your projects are great! I especially love the last one! Just lovely! Thanks for sharing your talent! Jen, your projects are fantastic! I particularly love the vintage balloons graduation card. These are terrific! And the vintage balloons are stunning! You are very creative! The sleeper here is that first card. It’s just beautiful. Vintage balloons, who knew?! I already loved this set, but now I have even more ideas for it. Thanks so much! Love them!! The vintage one is perfect! Gonna have to get that paper too!